I like sweets and as you all know sweets can spell disaster to any fitness program. 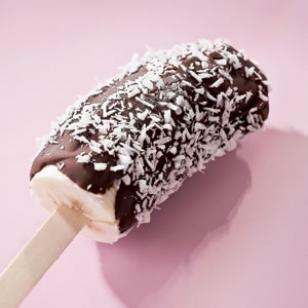 However I recently found a great recipe for Frozen Chocolate Bananas that fills that craving for ice cream and chocolate,that sometims hits. Best of all the kids like it too. The kids can help make them too, they will love dipping bananas in melted chocolate and rolling them in coconut to make this tasty frozen treat. If you don't like coconut you can also use chopped peanuts or a few candy sprinkles. Insert a popsicle stick into the cut end of each banana half. Place the bananas on the baking sheet and freeze until frozen, about 2 hours. Make Ahead Idea: Store airtight in the freezer for up to 1 week. Please note to melt chocolate, microwave on Medium for 1 minute. Stir, then continue microwaving on Medium, stirring every 20 seconds, until melted. Or place chocolate in the top of a double boiler over hot, but not boiling, water. Stir until melted. 100 calories; 4 g fat (3 g sat, 1 g mono); 6 g added sugars; 1 g protein; 2 g fiber; 7 mg sodium; 207 mg potassium.